For Grand Rapidians dreaming of being able to go grocery shopping near their home, the landscape is shifting. Incoming grocery stores will soon bring big changes to the city, and existing shops are expanding their options to meet the needs of a growing population. Plus, a co-op is in the works and aims to bring affordable and healthy goods to a food desert. So you live downtown, and you love your neighborhood stores. You can probably easily buy a tasty craft beer, pre-packaged granola bars and maybe even a gallon of milk within walking distance. But where do you get lettuce for the week? Tomatoes? Heck, even apples for the kids' lunches? While there are some options, the search for fresh produce in urban areas can be a challenging one because grocery stores aren't often found tucked in your closest burrow. This lack of access to fresh food causes some urban areas to be labeled as food deserts. 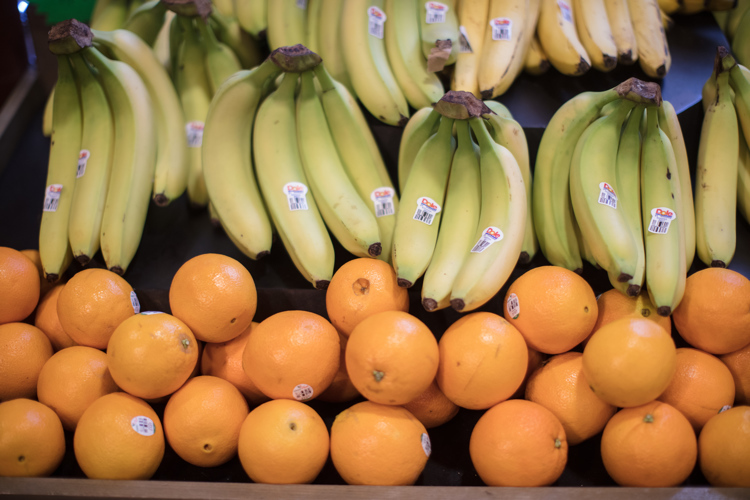 Calvin College defines food deserts as "large continuous areas within urban areas where healthy and balanced food stores are difficult to access. Food deserts are a growing problem in urban areas where most 'mainstream' grocery stores have moved out of the city to accommodate automobiles. The only easy options for people left within the city are 'fringe' food stores which specialize in unhealthy and processed foods." With an eye on filling the need for "mainstream" grocery stores in certain neighborhoods, real estate companies and other organizations have begun developing and constructing new grocery store projects throughout the city. On the west side, a new urban Meijer is in the works and is currently in the approval and development process. Set to occupy the corner of Bridge and Stocking and nicknamed "Stockbridge," this Meijer will take on a new form for the Grand Rapids-based collection of suburban grocery stores. "The urban store model is not their standard model. This is an entirely new thing for them," says Suzanne Schulz, director of the City of Grand Rapids Planning Department. Unlike standard Meijer super centers that encompass everything from dry food goods to clothing to baby supplies to home improvement, "it's really only grocery," says Schulz. "This is a much smaller footprint." 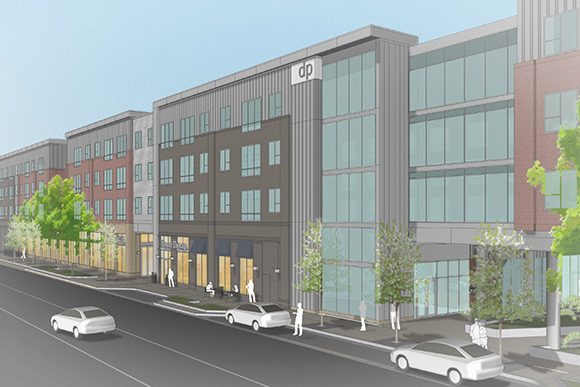 A rendering of the incoming Meijer on Bridge and Stocking. Aiming to fit into the neighborhood and provide only fresh food, this urban Meijer will take up approximately 40,000 square feet, compared to the their usual 150,000 to 200,000 square feet. Focusing on just groceries and eliminating peripheral items, this downtown grocery store will give urban dwellers a chance to purchase fresh produce close to home. 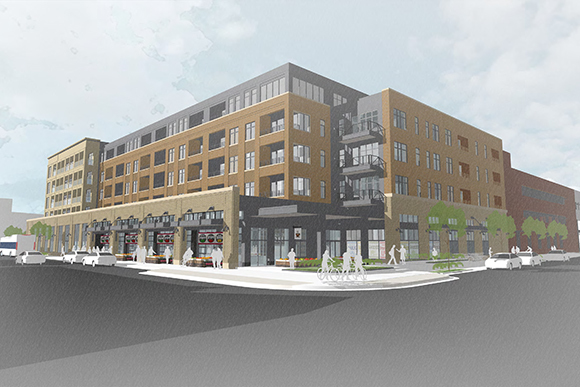 More details will be forthcoming as the development moves through the approval process; neither Meijer nor Rockford Construction, the grocery chain's partner for the project, could provide comment for this article. "The lack of fresh produce has always been a challenge," says Schulz. Though some market and specialty stores sometimes carry fruits and vegetables, they just don't have the necessary turnover to maintain their stock. "Sometimes that stuff sits for a long time," says Schulz. Having said that, some unique stores like Martha's Vineyard on Union have expanded its fresh produce selection, offering everything from deli meat to herbs and avocados. The Downtown Market also offers a small grocery selection. 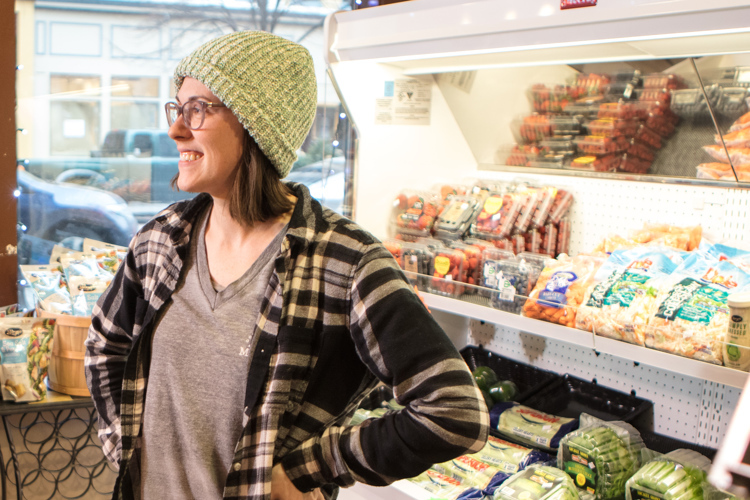 "We understand how vital it is for our community that all residents have access to fresh local food," says Downtown Market President and CEO Mimi Fritz. "When more people incorporate better food into their diets, the healthier our community will be." However, for numerous residents, stores offering fresh produce within walking distance are rare. One such store that is available to downtown residents is Grand Central Market on Monroe Center, and this family deli/convenience store is now expanding to meet the needs of a growing, hungry population. "We have, at Grand Central Market, been able to sustain the downtown residents with convenience items as much as we can. 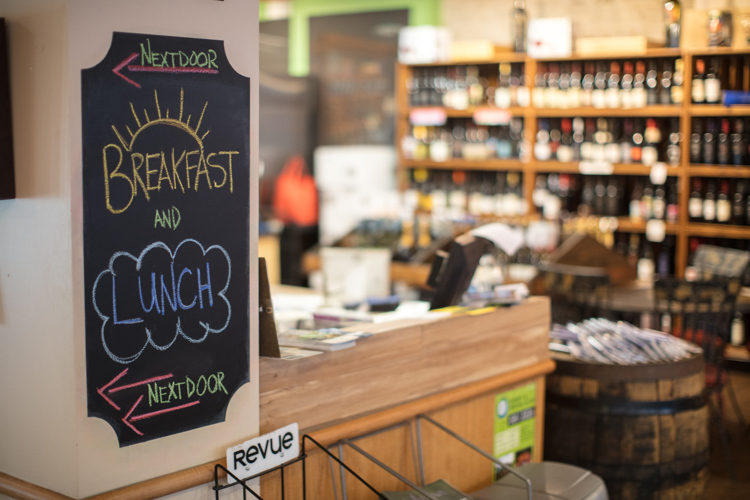 We are now doubling the size of our grocery area after moving our breakfast and sandwich area in the space next door," says Christina Meuser, the market's co-owner. Other specialty or corner shops' turnover rates are directly impacted by the number of residents living downtown. "You have to have a certain density and draw to get enough people to shop at that store," says Schulz. And that magic density number is 10,000 residents. While GR Forward, a 10-year community plan for Grand Rapids’ downtown, aims to increase the downtown population from the current number of around 6,000 to more than 10,000 in order to support businesses like urban grocery stores, the number right now is a precarious one. In order to meet demand, developers must carefully place grocery stores in peripheral areas that serve downtown residents, thriving neighborhoods and commuters to large companies. Looking to do exactly that is Third Coast Development, the biggest player on the Michigan Street corridor, nicknamed the "Medical Mile." Previously sticking to residential and office buildings like MidTowne Village and the Spectrum Health Daycare, Third Coast is branching out in the construction of Diamond Place, a mixed-use building on the corner of Diamond and Michigan that will include a first-floor grocery store. The project broke ground in January of this year and is set for completion in fall 2018. "The neighborhood certainly supports it," Schulz says of Midtown, an area that has been steadily growing as Spectrum invests heavily in the corridor, paving the way for more residential properties, restaurants and bars. "Spectrum alone is bussing almost 1,000 people up and down the corridor every day," says Schulz. In Midtown, Third Coast has certainly taken advantage of the magic combination of old residents, new residents and commuters. Unlike the Meijer development, Third Coast has not yet announced a retail partner to operate the grocery and the company did not respond to a request for comment. While Meijer and Third Coast aim to meet the need for fresh food with more traditional grocery stores, other groups are looking to unique organizational structures, like food co-ops. "It kind of shocked me just how limited the grocery store options are in our town," says Linda Jones, co-president of the Grand Rapids Food Co-Op Initiative (GRFCI). After relocating to GR a few years ago, Jones, whose family is involved in co-ops throughout the city, instantly recognized that the city was home to several food deserts, including parts of Heritage Hill, Heartside and Garfield Park. Seeking an alternative fresh food source that would allow residents to invest and receive returns, Jones founded the co-op two years ago and immediately began drawing members. With a business model that allows each member to buy in to the grocery co-op at $250 and in turn receive one voting share, GRFCI aims to highly involve each member. Jones will even offer reduced-cost membership at $25 per share in order to make the co-op accessible to low-income residents. This type of structure "keeps the money in the community," says Jones. Jones is currently working to increase membership to 1,000 people before GRFCI invests in a physical space, but she has her eye on a few key neighborhoods, like Southside, Baxter and Creston. These areas in particular encompass a few food deserts identified in Calvin College's food desert map of the city. Though the co-op will focus on natural, whole and organic foods, Jones and company understand that these are not always the most affordable options and, for a grocery store looking to eradicate a food desert, accessibility is key. Once GRFCI starts stocking their shelves, they will focus on products that are "as local as possible, as affordable as possible," says Jones. "Our vision is to offer more affordable choices that are still healthy." For Grand Rapidians dreaming of fresh produce within walking distance, the landscape is slowly changing. Now, residents either make the trek to a big box grocery shop, or stick to their corner shop and pick up select items. With developers and other groups filling in the gaps, the opportunity to purchase fresh food is steadily increasing.